Leica 50mm f/2 APO-Summicron-M Asph. (From Leica lens literature) Leica Camera AG presents a new milestone in the history of lens construction: the Leica APO-Summicron-M 50 mm f/2 ASPH. With the goal of creating a lens that fully achieves the opportunities offered by high-resolution camera systems, Leica engineers have successfully redefined the limits of what is technically possible. The result is an extremely high-performance lens that sets entirely new standards and currently stands as an exceptional talent amongst the standard lenses of the Leica M portfolio. 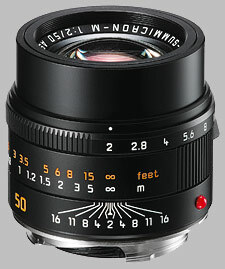 The Leica 50mm f/2 APO-Summicron-M Asph. doesn't have any user reviews yet!